The Finnish Army have operated several hundred of Russian artillery gun systems for decades. They vary in calibre (122mm – 155mm) and as such can weight up to 13 tonnes, so require not only a robust off-road utility truck to tow them, but that can also carry the ammunition needed to match these guns varying rates of fire (up to 8 rounds per min). 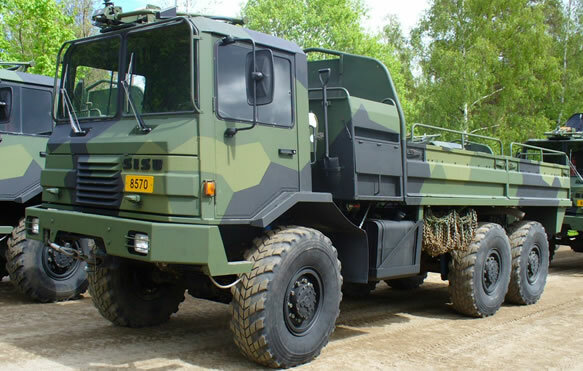 Sisu is a well established Finnish manufacturer of trucks and AFV’s. In the 1980’s, they started the development of the SA-240 to meet the above requirements. Production commenced in 1984 and ended in 1990. The rear section can accommodate 12 tonne of supplies (such as ammunition) or can transport troops on removable benches. The cab accommodates the driver and two troops.